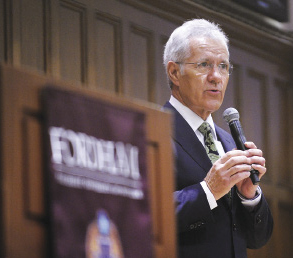 Alex Trebek mixes insight and wit in his appearance at Rose Hill. Those and other personal reflections were part of Trebek’s presentation at Rose Hill, which touched on his family, career and hopes for the future. Though known as a consummate intellectual who seems completely at home on a game show seen nightly by millions of people, Trebek admitted to feeling some unease at the outset of the evening. Yet his ability to quote Mark Twain and Confucius with equal aplomb left little doubt as to Trebek’s intellectual bona fides. Growing up in Canada, he was educated in primary school by Jesuits and Gray Nuns. He then attended the University of Ottawa Prep, where his teachers were Oblates of Mary Immaculate. 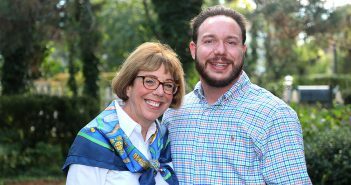 He noted that his son, Matthew, who attends Fordham, and his daughter, Emily, who studies at Loyola Marymount in Los Angeles, carry on the family tradition of Catholic higher education. He applied to the CBC as a part-time announcer and was offered a permanent position the following February. 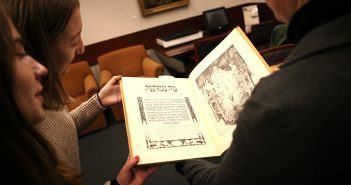 He accepted with the caveat that he be allowed to finish his philosophy degree. Despite the unintentional start to his career, he has ascended to the highest levels of broadcasting and celebrated his 50th anniversary in the industry this year. In a lengthy question-and-answer session, he was asked whether he would be a successfulJeopardy! contestant and how much longer he will continue in the role that has made him a television icon. He confided that he was unsure whether he would remain with the show when his contract expires in a little more than two years. He admitted, however, that after nearly three decades as host, he is still having a good time. He closed the evening with his thoughts about emerging technology, some of which was demonstrated recently on Jeopardy! when the IBM-built Watson supercomputer bested two of the show’s all-time champions. “We should never be afraid of the future, because we are going to figure out ways to deal with it,” he said. “If you’ve been following the Republican candidate debates, most of them make it sound like we don’t have enough bright people in America—but we do. We have them in all walks of life, and they are the ones who are going to make changes that will benefit our lives and all of humanity.